A series of religious activities were held yesterday to commemorate the 45th death anniversary of former Deputy Speaker and Agriculture and Lands Minister D A Rajapaksa in Medamulana in Tangalle under the patronage of President Mahinda Rajapaksa. An alms giving was held for over 60 monks following an all night Pirith chanting ceremony attended by Sripadastana Chief Incumbent Ven. Bengamuwe Dhammadinna Nayaka Thera, Kiri Vehera Chief Incumbent Dr. Ven. Aluthwewa Soratha Thera and Keppetiyawa Rajamaha Vihara Chief Incumbent Galketigoda Saddhananda Thera at Carlton House yesterday. 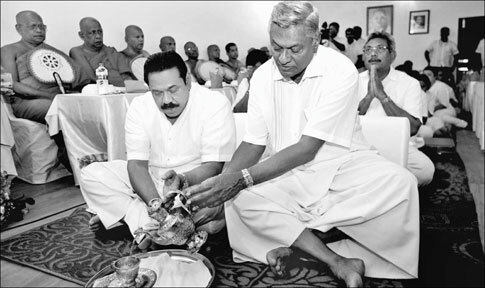 The Anusasana was conducted by Thissamaharama Chief Incumbent Dr. Devalegama Dhammasena Thera. Speaker Chamal Rajapaksa, Minister Basil Rajapaksa, Defence and Urban Development Ministry Secretary Gotabhaya Rajapaksa, First Lady Shiranthi Rajapaksa and relatives of the Rajapaksa family were also present.